A quality homestay/guest house in a seventeenth century manor house situated close to Pau and Orthez in south west France. Between the mountains & the sea, Fritz KISBY & Mike RIDOUT have made their home in this historic residence called 'Domaine de la Carrère' dating from the 17th century. It has been lived in by nobles, merchants and traders and was built during the reign of Louis XIV le Grand or le Roi-Soleil - the Sun King. They will make you welcome, but at the same time will respect your privacy. There are just five en-suite bedrooms for guests in the whole of the property. Browse around their web-site... see the house, gardens & swimming pool. 'Domain de la Carrère' at Arthez-de-Béarn in the Pyrénées Atlantique is centred twixt la Cité d’Henri IV PAU (20 mins) which epitomises the best of French culture, dynamism, & beauty.....and glitzy BIARRITZ (40 mins)......the mountains of the PYRENEES and SPAIN (1 hr)...and just 10 mins from ORTHEZ. Our photos include two typical spacious bedroom/suites with dressing rooms - two 4-ft single beds or antique double bed - also en-suite large shower room: power shower, double sink unit, toilet, hair dryer, dressing gowns and toiletries. Tea & coffee facilities, TV., radio alarm. A quality Table d'hôtes (dinner), apéritif, starter, main course, cheese, sweet, wine & coffee, is available on request. un endroit superbe, des hotes charmants - a decouvrir absolument! Ne manquez pas de loger ici si vous etes dans la region - Mike et Fritz sont des hotes exceptionnels et leurs chambres d'hote sont superbement decorees et tres confortables. je voyage souvent pour le travail et j'ai eu le plaisir de loger plusieurs fois chez eux lors de mes deplacements professionnels. La qualite de leur accueil et la beaute de leur demeure etait un repit delicieux apres une journee de travail harassante. C'est egalement un endroit ideal pour un sejour en amoureux - Mike et Fritz savent etre tout a la fois attentifs et discrets. Leur table d'hote est egalement excellente. Une des meilleures chambres d'hote que je connaisse! Beautiful home, delightful hosts - the best B&B you could find! Don't miss this wonderful place if you are in the region - Mike and Fritz are 'dream hosts' and their home is truly a home away from home. I travel often for business and had the pleasure of staying many times at their B&B and it was delightful - comfortable, inviting, restful - just what i needed after a long day on the job. A beautiful setting for a romantic or just plain restful leisure stay as well - i highly recommend it! We can not recommend Domaine de la Carrere enough. I booked this beautiful French Mairee direct with the owners Mike and Fritz directly. From the outset they were friendly and extremely helpful. Upon arrival, we were greeted enthusiastically and welcomed with Early Grey tea and biscuits on the sunny terrace. The house itself it beautifully decorated with fine and unusual antiques and every corner has something interesting to look at. We were shown most of the other rooms (we were lucky to have the whole place to ourselves for three nights!) and they are all extremely tasteful with huge walk in showers and nice touches such as an extensive tea tray and coffee machine. There is also a fantastic pool although we were unable to use it due to the weather. Fritz and Mike kindly took time out to describe local areas of interest and Fritz even printed off maps and directions for us. So despite the weather, we found we had plenty to occupy us in this beautiful area of France. At night the Mairee is very peaceful and can definitely be recommended if you want to get away from it all. Originally we were only going to eat at the Domaine on our night of arrival but the food was so good, we cut short a visit to a friend's place to come back and eat for a second night. Fritz must be a professional chef, the quality of the ingredients were superior (even by French standards!) and the presentation excellent. Mike also made suggestion on local wines to try for an aperitif - delicious! Breakfasts are very wholesome with a choice of croissants and preserves, cereal and juice - all served in the elegant dining room. We hope to come back sometime soon - Mike and Fritz are the ultimate hosts...and real characters with interesting stories to make you laugh. We were made to feel really at home and came back feeling most relaxed. 5 Star Service, 5 Star Standards. We had a wonderful two night stay at this amazing B&B. Everything was perfect and the swimming pool was wonderful. The owners were very friendly and nothing was too much trouble. An excellent place to stay! Fantastic stay for three nights in August, Mike and Fritz were terrific hosts ensuring our family had a lovely break. Will definitely return when batteries need recharching again. 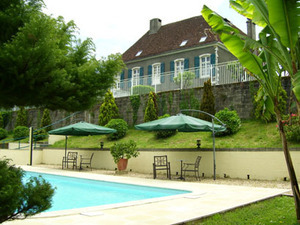 The house and rooms are immaculate and the pool is a real sun trap, all in a very idyllic area of France. Mike and Fritz were very helpful in offering ideas for visits and places to eat all supplied with handrawn maps giving directions. Had a great night at a local Chateau at the village firework display and party, seemed like all the villagers from miles around were there, making a great atmosphere.